← So, I married a sun worshipper…. This post is in no way designed to ensure that my sister, who is coming over in a month or so, fills her suitcase with Bell’s Steak & Gravy Pies, Lyon’s Sports Mixture, Ruffle Bars et al. She suggested that I do a blog on shopping up Barcelona, it was a grand idea but there is a slight problem.. One of the reasons I love Mrs B. is that she has a pathological hatred of shopping. Her shopping skillz are SAS-like. In and out before anyone realises she’s been there. I have never been dragged round the shops by her in our 10 years together and for that I am truly grateful. I actually made a decision that should I ever be given 6 months to live then I am becoming a shopaholic, I won’t actually live longer, it’ll just feel like it. The best place to start for the majority of weekend visitors will be Plaza Catalunya. 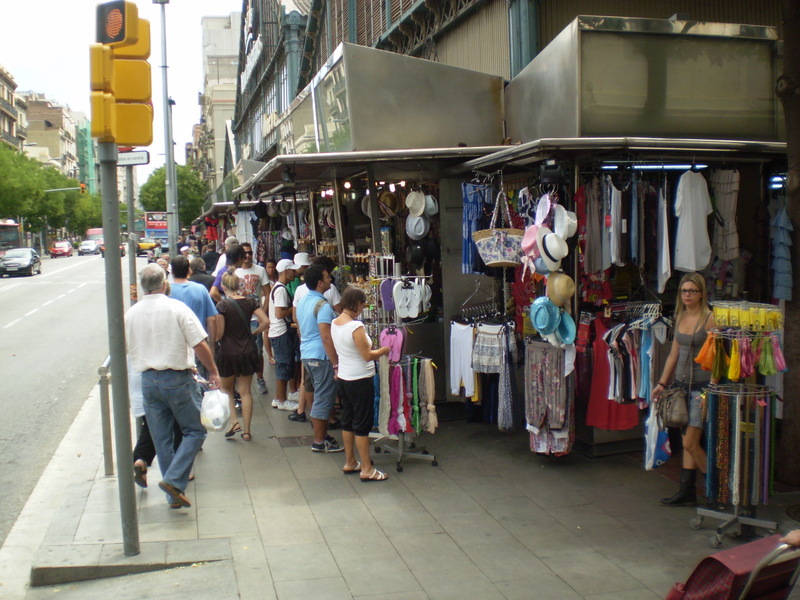 Here, you are within striking distance of familiar shops like Zara H&M, Massimo Dutti and the Spanish John Lewis, El Cort Ingles. These shops are all within walking distance of the Plaza and if you stroll up Passeig De Gracia you’ll see a lot of designer shops you’ll recognise from magazines etc. That said,a very wise friend of mine, “God’s Commando” once commented that in their teens, women will self harm if they are not wearing exactly the same clothes as their pals, as they get older they will develop acute agoraphobia if the have the slightest suspicion that someone within a 40 mile radius has the same top. Apparently the chains like Zara and H&M do have items that either will never be sold in the UK or are available months ahead of their appearance in the UK so that may be value for money in some people’s eyes. If you stray into some of the barrios a little out from the centre you can be rewarded. On a lot of the main streets you’ll find independent shops that have the potential for a bargain. In particular there are some shoe shops that are worth an explore if you have a touch of the Imeldas about you. There are also a number of markets dotted around the city, they have food stalls and around the perimeter you’ll find little clothing stalls. If truth be known the majority do specialise in “Special Needs Chic”, they have the look of the functional rather than the fashionable. But again that doesn’t mean there won’t be a bargain in amongst the cream slacks and white sports socks. There is one type of shop that I do love here in Barcelona and they are to be found on every street, outside the main tourist centre, in the city. The Chinese Bazaars, they are the equivalent of yer pound shops coupled with, what used to be called “Fancy Goods” shops in the uk. They sell a fantastically disparate range of goods and are a godsend if you have forgotten to pack something. The reason I truly love them is that they all do a fantastic range of “Taig Tat”, religious artefacts for the discerning Christian. I have purchased a neon lit crucifix that played hymns for my sister but only because they had sold out of “Punk Jesus”. Our saviour never looked as good as he did with luminous green hair and equally luminous stigmata. 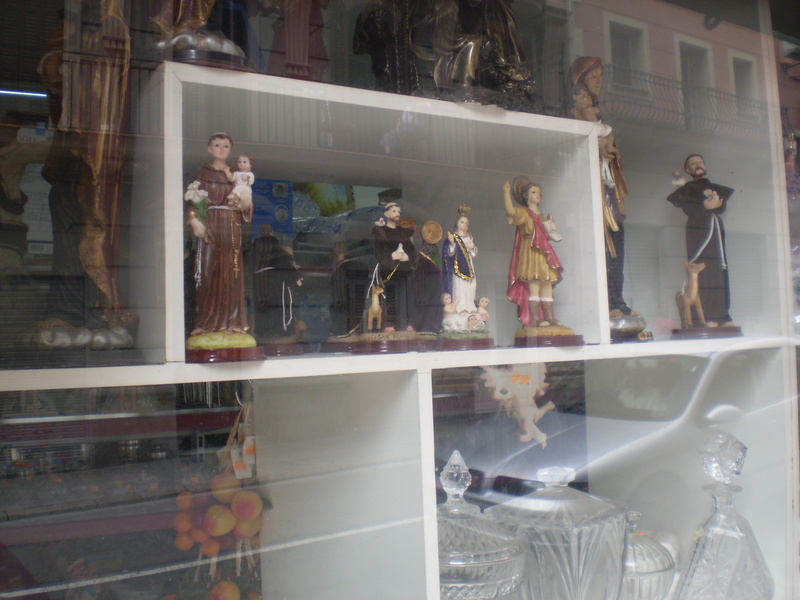 This entry was posted in Ramblas area, Shopping, Uncategorized. Bookmark the permalink.